Every kid must learn a set of high frequency words to be a successful reader. 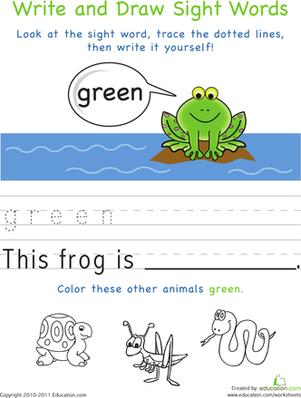 Boost your kindergartner's confidence in her reading skills with the fun sight word exercises in this set of worksheets. Learning the sight word "on" is an important step to reading fluency. 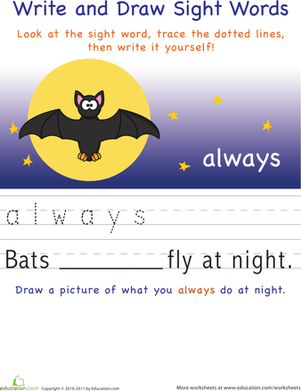 This worksheet will help kids practise by tracing, writing and coloring the word. 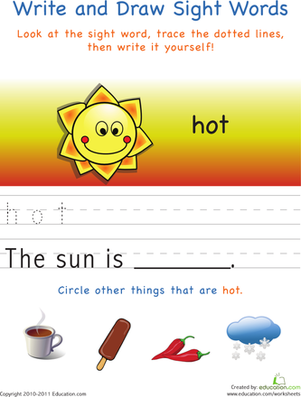 This worksheet introduces your child to the word "has" by asking her to first trace the word, then write it on her own in a sentence. 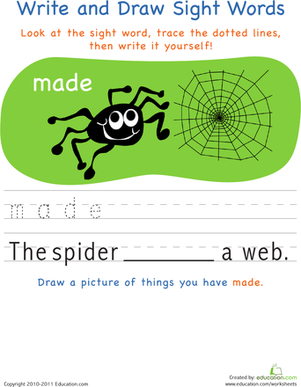 By completing this sheet, preschoolers will practise their handwriting and build their budding vocabulary. This worksheet challenges kids to trace the word "up" and write it on their own in a sentence, important exercises for new readers and writers. 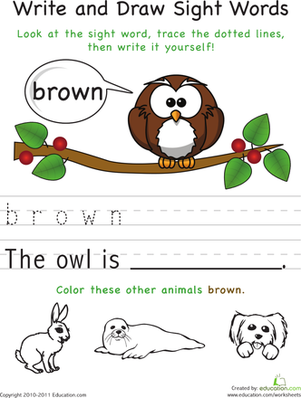 Boost sight word learning with this simple worksheet that's all about the word "brown." 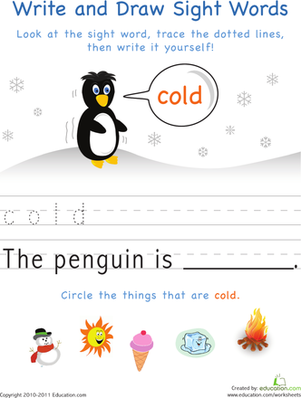 This worksheet makes learning sight words a hands-on activity as your child traces the word "cold" then practices writing it himself. Learning how to read and write numbers is an important building block. 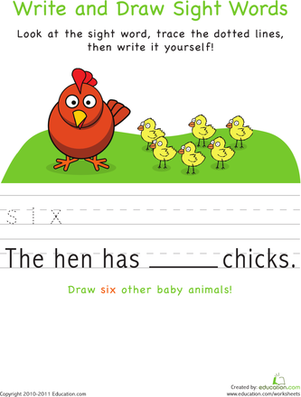 This worksheet focuses on reading and writing the word "eight." 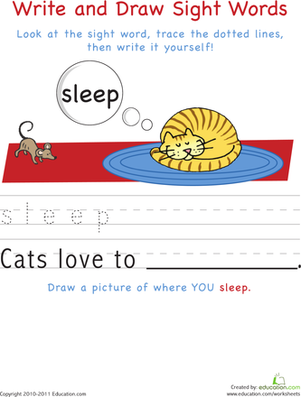 This worksheet builds reading and writing skills, and shows kids that reading can be fun! Kids practise tracing the word "fly", then write it in a sentence. 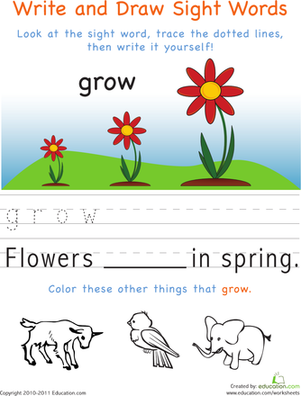 This fun worksheet, all about the word "grow," is chock-full of fine motor skills practise, including tracing, writing, and even a coloring activity, too! What letters is the word "made" made up of? Find out on this great writing worksheet. A Write and Draw Sight Words worksheet on the word 'never'. Perfect for preschoolers learning to write and spell. Language arts skills take practise to build. This worksheet helps your child practise writing the number "seven" by tracing, writing, and drawing the word. Learning sight words doesn't have to be boring. This worksheet adds in a fun drawing activity to get kids excited about learning to spell the word "six." 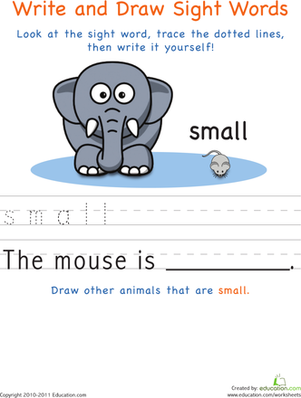 This worksheet practices spelling, handwriting, and reading comprehension skills by asking kids to trace and write the word "two." 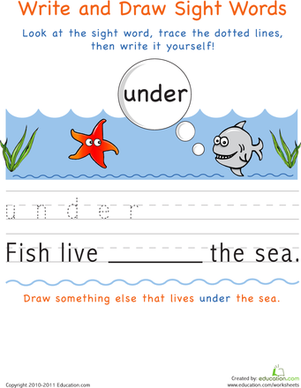 Practise writing and spelling with this worksheet featuring the sight word "under." After tracing and writing the word "walk" on this worksheet, your child will use his imagination to draw a picture about the featured word. In this worksheet, your child will practise tracing the word "white," and then write it on her own in a sentence, helping to build strong reading skills.